Now available: bibliographies starting in 1960, 1970, 1980, 1990, 2000, 2010. See also 2017 or go to 2019. Note cumulative scientific bibliography for the 2010's (with links to earlier decades). 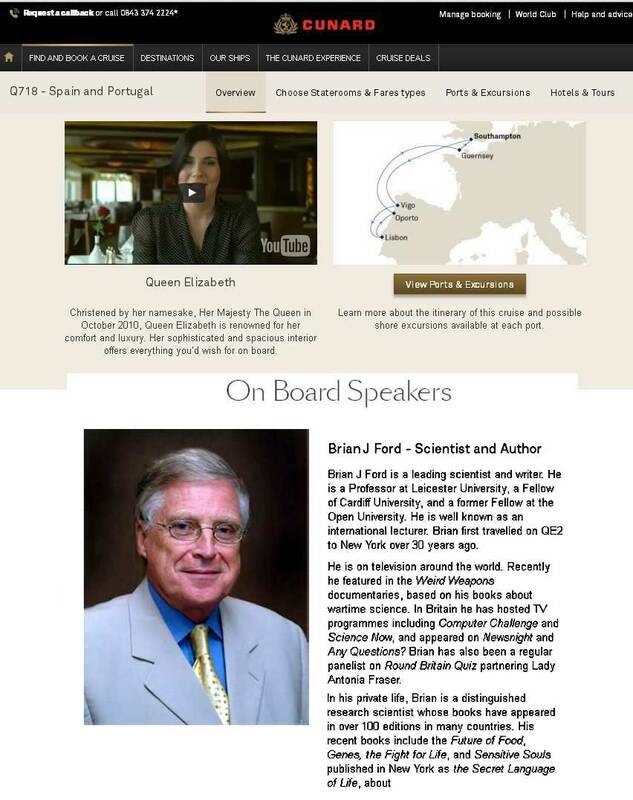 Report, 2018, onboard speaker biography from Cunard brocuhure. 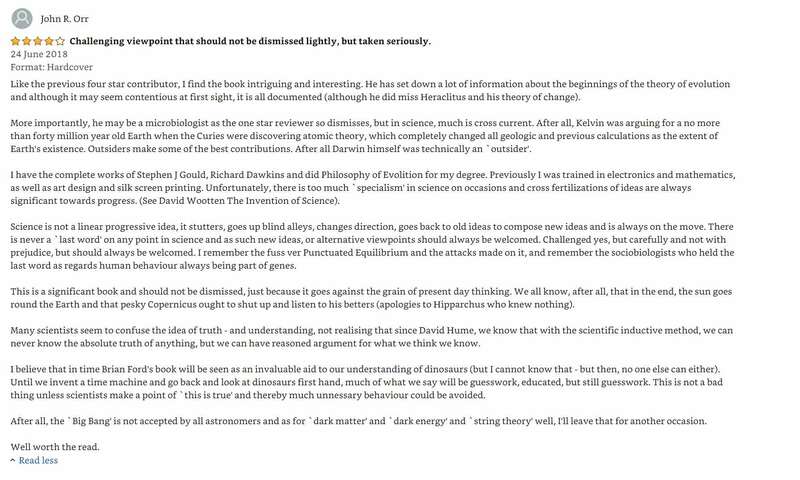 See also: passeneger's post online. Sailing: Southampton; Arrecife, Lanzarote; Las Palmas de Gran Canaria; Santa Cruz de Tenerife; Santa Catarina, Las Palma; Funchal, Madeira; Seville, Spain; Lisbon, Portugal; La Coruna, Spain; Southampton. 23 December 2017 - 7 January 2018. Announced on NHBS web site. Announced on W. H. Smith site. Announced on Wild Sounds site. Announced on Standaard Boekhandel, Netherlands. Announced on Libres Libre, Montenegro. Wiseman, Eva, 2018, Breaking the cycle - women are learning to love their hormones [cites Brian J Ford on Secret Weapons of WWII], The Guardian online, 25 February. 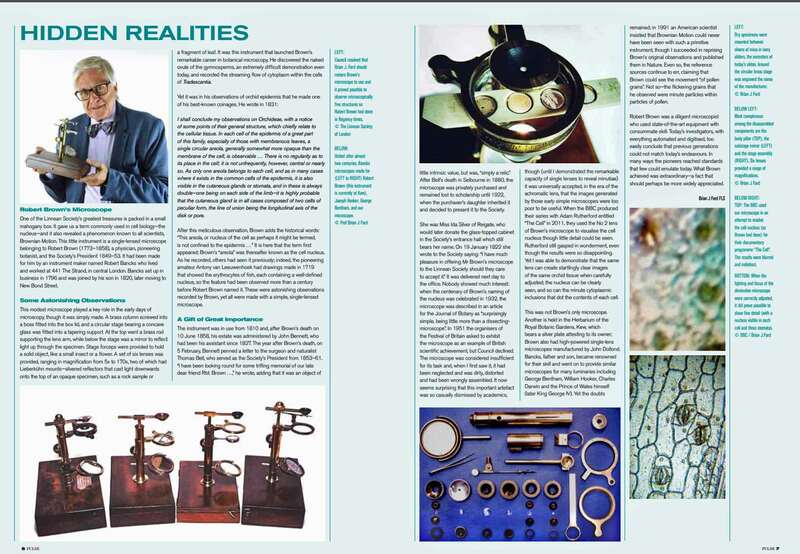 BJF, 2018, Microscopical Realities and Fake News, InFocus, Proceedings of the Royal Microscopical Society, 49: 38-53, March. 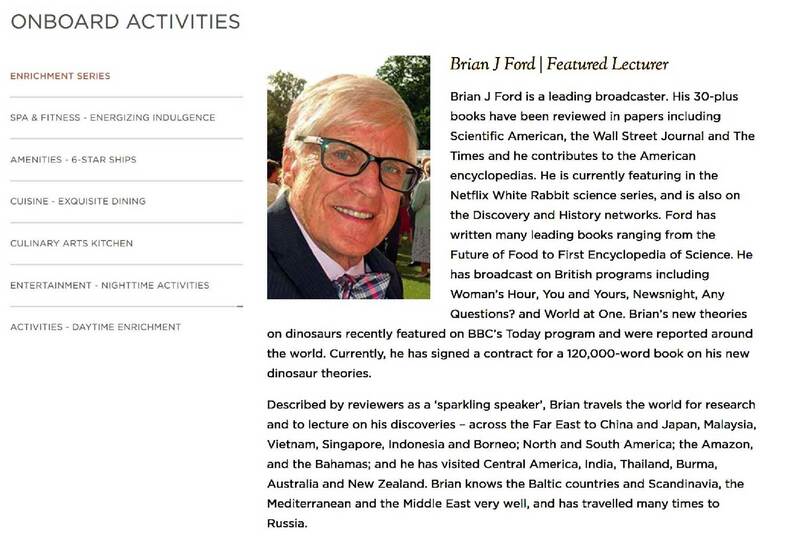 Report, 2018, featured lecturer's biography from the SS Explorer brochure. Capture Caribbean Memories that Won't be Forgotten (79-425) Constellation Theatre, 10:00h, 12 March. The Secret Story of the Caribbean Pirates (79-426) Constellation Theatre, 10:00h, 13 March. Hidden Caribbean Wildlife that you Never See (79-427) Constellation Theatre, 10:00h, 18 March. What will we Eat in the Future? Constellation Theatre (79-428) 10:00h, 19 March. Sailing: Miami, Florida, United States; Basseterre, St Kitts and Nevis, West Indies; Castries, St Lucia; St John's, Antigua; Gustavia, Saint Barthélemy; Great Stirrup Cay, Bahamas; Miami, Florida, United States. 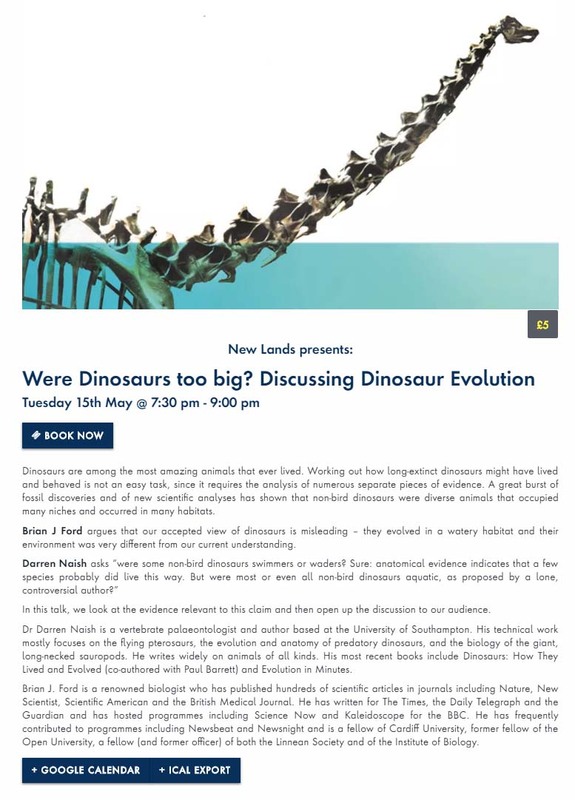 Naish, Darren, 2018, comments on forthcoming aquatic dinosaur debate in London, TetZoo blog, March. 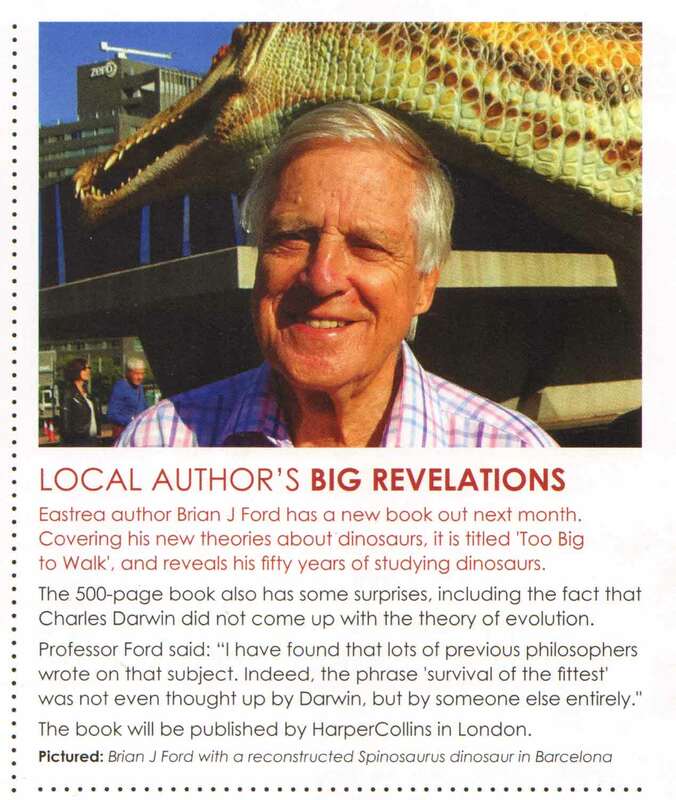 Report, 2018, Local author's big revelations (with photograph), Discovering Whittlesea magazine, 165: 15, April. 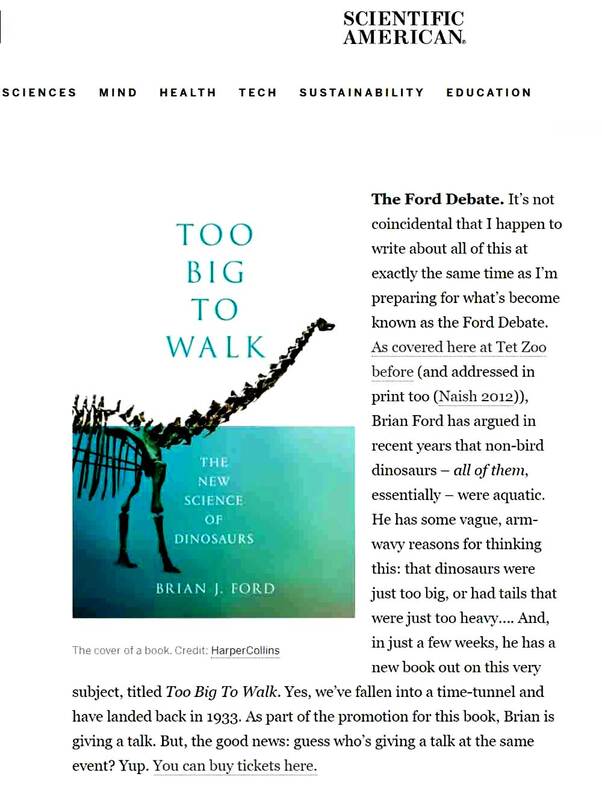 Naish, Darren, 2018, The Ford Debate, Scientific American blog, 17 April. Announcement, 2018, aquatic dinosaur debate ("The Ford Debate"), original announcement, London: Conway Hall, 18 April. 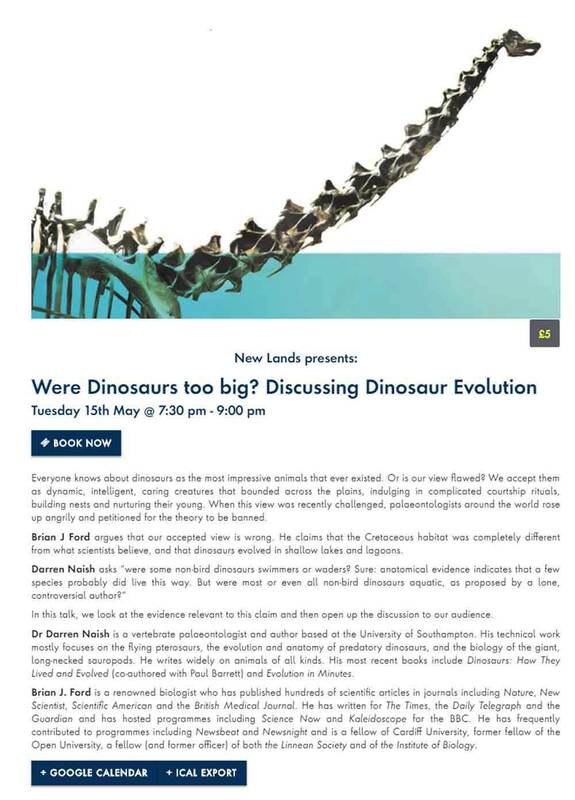 Announcement, 2018, aquatic dinosaur debate ("The Ford Debate"), amended announcement, London: Conway Hall, 26 April. BJF, 2018, Critical Focus No 31: Can we Understand Obesity? Fat Chance, The Microscope 66 (1): 35-45, 2018. Report, 2018, Brian J Ford to present The Robot and the Single Cell, Inter/Micro 18, Chicago: McCrone Research Institute, April. 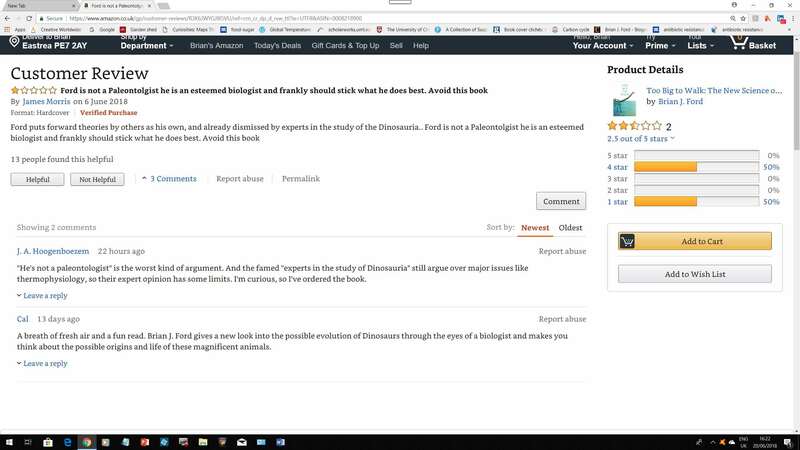 BJF, 2018, Were Dinosaurs too Big to Walk? Illustrated presentation at the Ford Debate, London: Conway Hall, 15 May. Carlos Prego, 2018, El microscopio de Leeuwenhoek que emergió del lodo y terminó subastado en eBay , [reports Brian J Ford and the Camacho microscope], Hipertextual, 25 May. BJF, 2018, Critical Focus No 32: AI: Artificial, Yes. Intelligent, Not, The Microscope 66 (2): 71-83, 2018. Alzbeta Semrova, 2018, Zahada samovzniceni: Dokaze telo vykresat jiskru? [Czech report of Brian J Ford research into spontaneous human combustion], Epocha Plus magazine, 4 June. James Morris, J A Hoegenboezem & Cal, 2018, Online reviews of Too Big to Walk(q.v. ), on Amazon.co.uk, from 6 June. 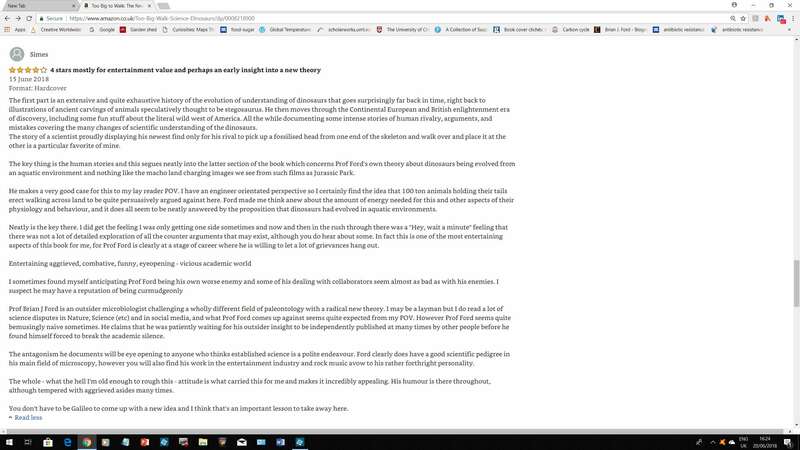 Simes, 2018, Online review of Too Big to Walk (q.v. ), on Amazon.co.uk, 15 June. 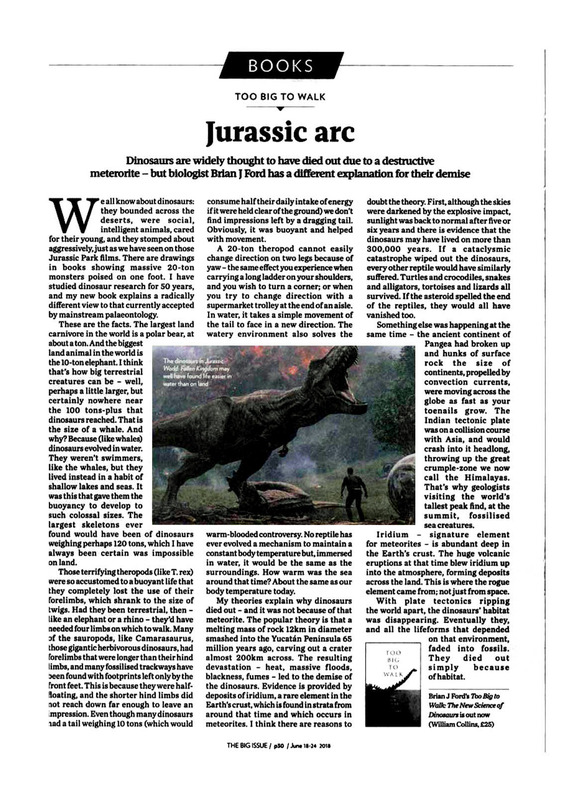 BJF, 2018, Jurassic Arc, The Big Issue: 30, 18-24 June. John R. Orr, 2018, Online review of Too Big to Walk (q.v. ), on Amazon.co.uk, 24 June. BJF, 2018, featured in Murder in Soho: Who killed Freddie Mills? Producer Simon Dales, 21:00-22:30, BBC Four television, 1 August [see also BBC television trailer]. Sailing: Stockholm, Sweden; Tallin, Estonia; St Petersburg, Russia; Helsinki, Finland; Riga, Latvia; Klaipeda, Lithuania; Rostock, Germany; Copenhagen, Denmark. BJF, 2018, Critical Focus No 33: The Life Force That Breaks All the Rules, The Microscope 66 (3): 117-127. Coming to Alaska (81-434), Regatta lounge, 8 September. Alaska’s Greatest Spectacle (81-437), Regatta lounge, 14 September. The Alaskan Wolf holds the clue that made us Human (81-438), Regatta lounge, 16 September. How Alaska Got Here (81-439), Regatta lounge. Sailing: Seattle, Washington, USA; Inside Passage, Alaska; Hubbard Glacier, Alaska; Icy Strait Point and Hoonah, Alaska; Skagway, Alaska; Sitka, Alaska; Victoria, Vancouver Island; Vancouver, British Columbia. 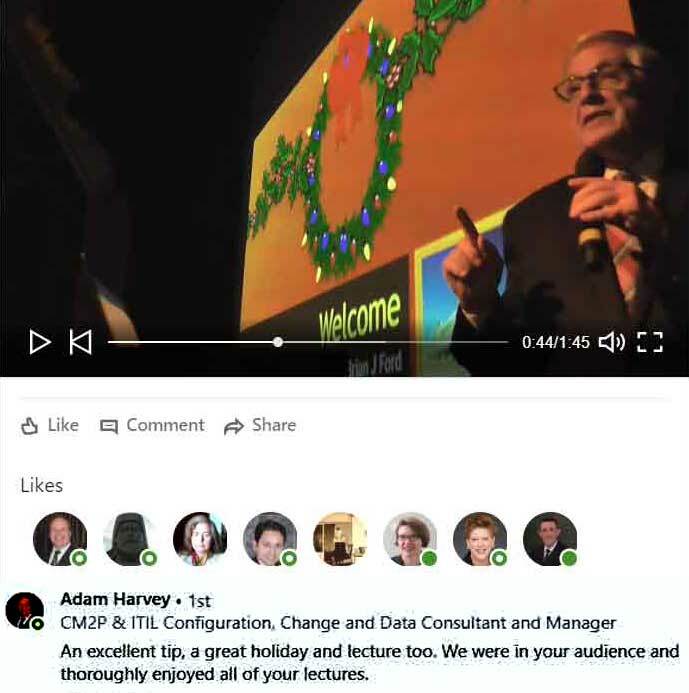 See online closing comments from the final presentation. BJF, 2018, Critical Focus No 34: Feces, from Start to Finish, The Microscope 66 (4): 166-176. How North America was Born (82-440), Insignia Lounge: 17:00, 25 September. Camera Secrets Revealed (82-441), Insignia Lounge: 14:00h, 26 September. Finding America (82-442), Insignia Lounge: 10:00h, 27 September. The Hidden Fable of the Fall (82-443), Insignia Lounge, 15:00h, 27 September. Wonders of the Northern Lights (82-444), Insignia Lounge: 09:300h, 29 September. Fantastic Foods from the Future (82-445), Insignia Lounge: 17:030h, 01 October. Sailing: Montreal, Canada; Quebec, Canada; Saguenay, Canada; Sydney, Nova Scotia, Canada; Halifax, Nova Scotia, Canada; Saint John, New Brunswick, Canada; Portland, Maine, USA; Boston, Massachusetts, USA; Newport, Rhode Island, USA; Manhattan, New York City, USA. 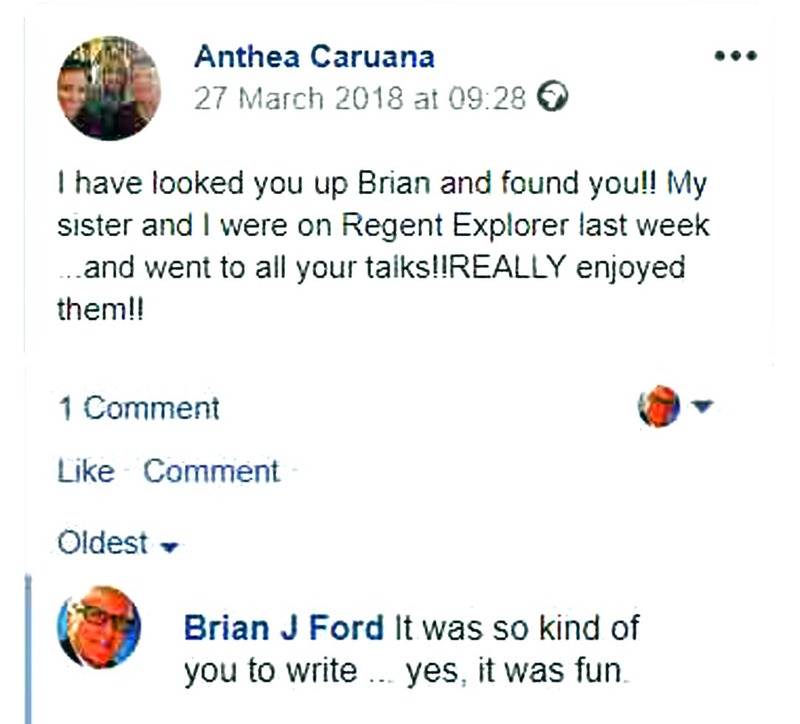 Report, 2018, Cruise Director's report on lecture tour, Regent Seven Seas. 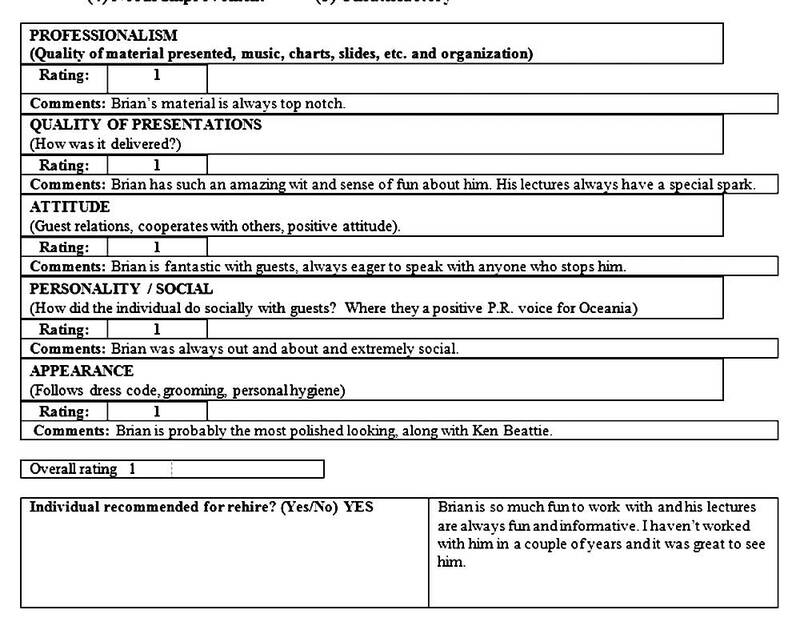 Carter, Shawn, 2018, Cruise Director's endorsement from lecture cruises, Oceania Cruise Line. BJF, 2018, Hidden Realities, Pulse 40: 6-7, London: Linnean Society, December. Return to previous year 2017 or move to 2016.